A Wanderer’s Exploration of the English Lake District. We embarked on this project primarily as a response to having been involved in rewarding, though very intensive digital projects for 2 years. The initial idea was simply to create a tangible piece of artwork over which we had complete creative control. 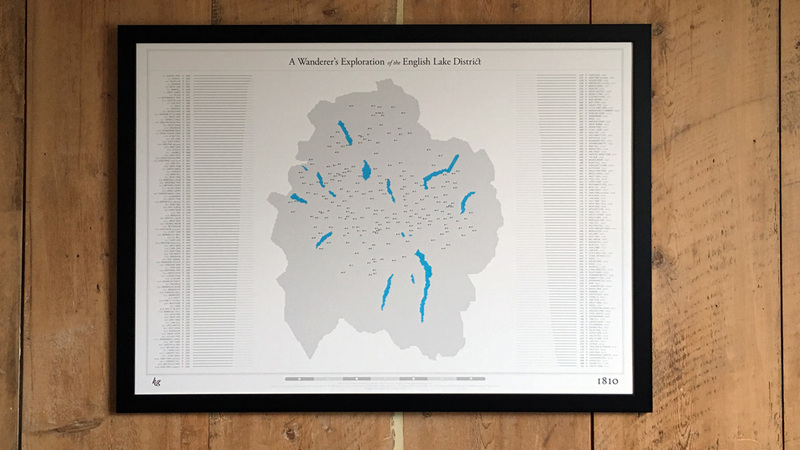 We’ve been avid fell-walkers most of our lives and unsurprisingly, the idea to produce this data visualisation came to us while wandering the mountains of the English Lake District together. Unable to find a suitable artwork that would allow us to record and display our ascents of the Wainwright classification of mountains, we were inspired to create our own. The project became a real labour of love and as a beautiful piece of data art, represented the perfect blend of our skills. It’s an object of genuine beauty – one that lists the fells and elegantly brings to life, with a gently shelving line, their different heights. 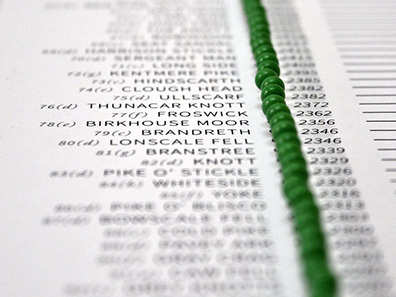 Those lines also offer a space to record the details of each ascent—the date, weather and other memorable facts. Suggestive of mountain peaks and triangulation points, the central map is comprised of thousands of tiny triangles that were inspired by the glass roof of the British Museum. At a distance, they appear to merge with one another to form flat colours, while close up they provide a stunning intricate pattern. Like the fells themselves, the map is made of sturdy stuff. It’s printed by Ted Chau on heavy museum-quality archival stock, using long life pigment inks – then heat-mounted on aluminium reinforced Kapa® board. It’s framed in the heart of the Lake District by Youdell’s of Kendal, while the pins are sourced from artisan pin-maker, Moore of Pennsylvania. Needless to say, we’re very proud of the result. Mounted and framed first-run editions are available for sale in strictly limited quantities. Read about our collaboration with best-selling author and cyclist Simon Warren.